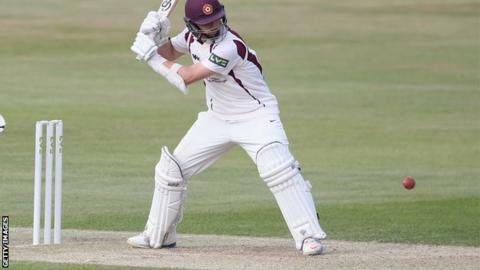 Australia-born Steven Crook scored a quick-fire century as Northants made hay on day two of their rain-affected tour match against Australia. With the first day at Northampton lost to rain, Crook took 77 balls to reach his ton and recorded a career best 142 not out in Northants' total of 396. Australia's Mitchell Marsh staked a claim for a Test recall, taking 4-56. David Warner was then caught by Crook off the last ball of the day as the tourists reached 13-1 in reply. With the Ashes already lost, this is the only chance for Australia's fringe players to impress before the fifth and final Test begins at The Oval on Thursday, and Steve Smith, who will replace Michael Clarke as Test captain after that game, decided to field first after winning the toss. Adelaide-born all-rounder Crook, 32, whose UK passport has enabled him to play for Lancashire, Middlesex and Northants since 2003, was dropped by Shane Watson on 91, but made the most of his let-off in an innings which included 24 fours and four sixes from 96 balls. He was ably assisted at Wantage Road by Scotland batsman Kyle Coetzer, whose 86 was his highest first-class score since August 2013. Australia rested five players from the fourth Test defeat at Trent Bridge, including their three-man pace attack, and it was only Marsh, who was dropped after the third Test at Edgbaston, who would have impressed the selectors with some disciplined seam bowling. When Marsh dismissed Rob Keogh and skipper Josh Cobb with successive deliveries, Northants were teetering at 162-4, but Crook steadied the ship as he bludgeoned the Australian attack with some powerful hitting.